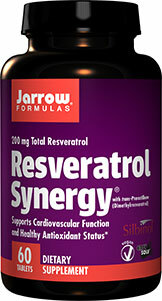 Jarrow Formulas® Resveratrol Synergy® brings together resveratrol (3,4’,5-trihydroxystilbene) and other powerful antioxidants resulting in a potent synergistic formula that supports the cardiovascular system. 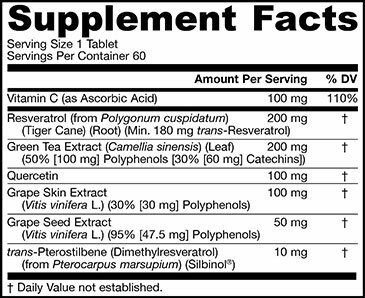 * Pterostilbene, also known as dimethylresveratrol, is a methylated naturally-occurring form of resveratrol. Methylation greatly improves intestinal and cellular uptake of this nutrient while reducing excessive liver clearance. Another benefit is weight loss. Cellulose, calcium phosphate, stearic acid (vegetable source), magnesium stearate (vegetable source), silicon dioxide and a food grade coating. pTeroPure™ is a trademark of ChromaDex, Inc.